A quick reminder about the discussion “Reflections on knitting in the media – how would we represent the history of knitting?” at the Knitting History Forum Conference this Saturday. Participants are reminded to prepare by seeing the documentary ‘The Secret History of Knitting’, freely available on Youtube. Made by Blue Ant Media, the programme features interviews with Joyce Meader, Jane Malcolm-Davies and Sandy Black, who will be leading discussion this Saturday afternoon. 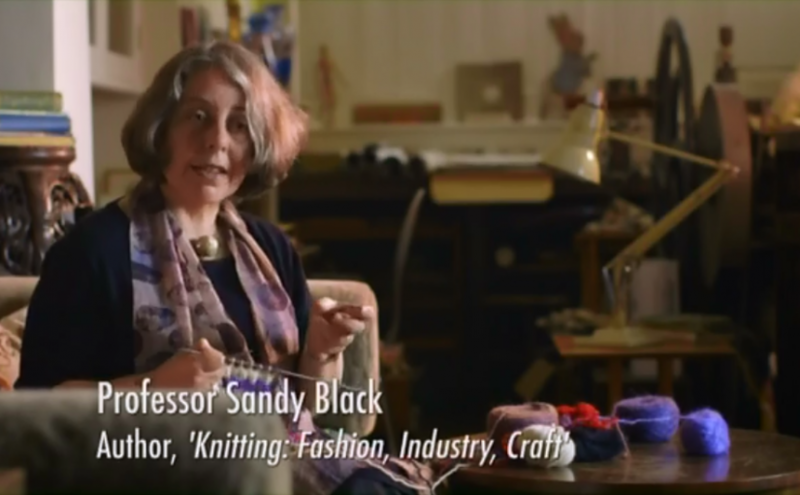 Follow the link to watch ‘The Secret History of Knitting’ https://www.youtube.com/watch?v=bJiN9GNrDpA. Another documentary that may be of interest to delegates is ‘Fabric of Britain – Knitting’s Golden Age’. First shown in 2013, this programme was made by the BBC and is available to viewers in the UK with a TV Licence and access to BBC iPlayer (and possibly a few other viewers too). The similarities and contrasts to ‘The Secret History of Knitting’ are pertinent to our discussion. Viewers may recognise another interviewee – see above! There are 8 days left to catch this episode online. Click the link to watch ‘Fabric of Britain – Knitting’s Golden Age’ at the BBC website http://bbc.in/1CyVEmV.